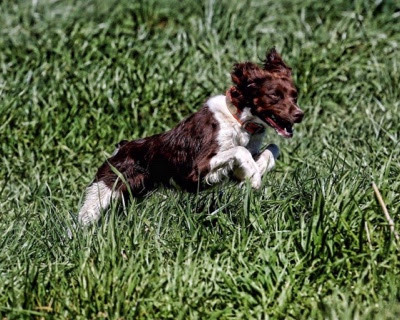 A Bird Hunter's Thoughts: My little one, Pearl, field trialing. Git 'er done! My little one, Pearl, field trialing. Git 'er done! 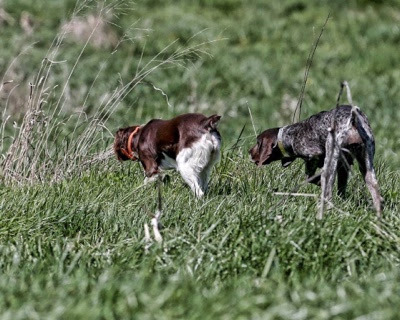 In every pack or every group of bird dogs a fairly strict social hierarchy exists. At the top of my pack is the ruler of the kingdom and the doler out of the favors- that would be me. Next, the top dog, is Cap (he thinks of himself as the "wonder dog") followed by Ruby, then Shack. Low on the totem pole is Pearl. She's the youngest female and is the smallest, as well. 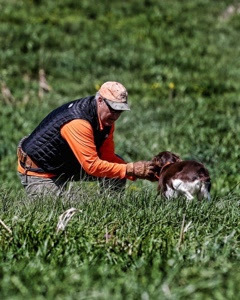 At two and one half years, she still gets more of a thrill out of seeing a covey fly then locking them down and waiting for me. This is not an insurmountable problem, and I fully expect this year to be her year to put it all together, but when the unavoidable comparisons are made with the rest of the pack....well, she is my happy little girl. I trial all my dogs. It teaches them so many good things and it makes me teach them the basics. A dogs that will point, retireve and back, hunt objectives and remain obedient in the field will be able to transition to the hunt very easily, I've found. 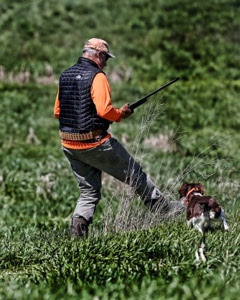 My trial format of choice is NSTRA (National Shoot to Retrieve Field Trial Association). 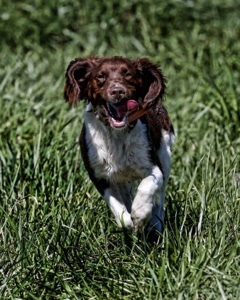 I took my little girl to a NSTRA trial the other day, just to test the waters. I think she did very well, although the score card may not have reflected that opinion. She had lots of heart and worked hard to the very end. Hey, I found one....right here! Get him up, boss! I'm ready. So, she may not be my hottest ball-of-fire. But she's still my girl and she's still in the line-up. I can feel it in my bones that this will be her "break out" season. My little Pearl. How do you relate to your dogs?